Rosco, a leader in automotive vision safety, featured the Mobileye Shield+ Collision Avoidance System at the 30th Annual Equipment & Vehicle Show. The show reflects the ongoing push for initiatives such as Vision Zero and NYC's Clean Fleet. 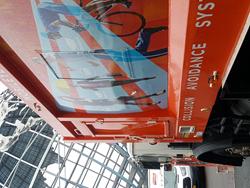 Rosco featured a refuse truck equipped with Mobileye® Shield+ Technology to demonstrate the advantages Sheild+ offers as an Advanced Driver Assistance System (ADAS) and Collision Avoidance System. Rosco continues to participate in the NYC Fleet Show and is an avid supporter of the Vision Zero movement across the country. The number of cyclists and pedestrians on the road have increased across the nation. Drivers and fleet operators face new challenges as they share the roads with more vulnerable road users (VRUs). Statistics from the Department of Transportation show a spike in bicycle trips of 150% between 2006 and 2016. This uptick along with the challenges of operating a large refuse truck in an urban demand the highest level of awareness by the vehicle operator. While drivers of all automobile types experience blind spots, most cannot appreciate the complexities that come with operating a large truck and the limited visibility of the operator. These complexities multiply when the vehicle is turning; blind zones widen and the probability of collisions increase. Mobileye Shield+ addresses these obstacles and assists operators to ensure a safer driving environment. Shield+ yields simple left, center, and right alarm interfaces that communicate audio and visual alerts to drivers based on the directional location of VRUs and the potential for collision. Utilizing smart cameras, the system identifies a variety of potential dangers on the road, such as other vehicles, cyclists, and pedestrians. An “intelligent” external alert system sends audible alerts to VRUs around the bus to ensure they are aware that the bus is within the vicinity and maneuvering around them. Shield+ also includes features available on the Mobileye Single Camera System such as Forward Collision Warning, Speed Limit Indicator, Lane Departure Warning, and Headway Monitoring. About Rosco - Rosco, Inc. is a leading global manufacturer of automotive vision safety products to the bus and truck marketplace. Founded in New York City in 1907 as a safety product manufacturer for automotive and aeronautical markets, Rosco moved to its current location in Queens, New York in 1974. Rosco products are designed and manufactured in the USA and include mission critical driving safety aides such as interior and exterior mirrors, sun visors, backup and side view cameras, video recording systems, sensor products and collision avoidance systems. Today, Rosco is the largest manufacturer of bus mirrors in North America. Rosco’s staff has grown to over 250 employees in facilities totaling 150,000 square feet.Key fleet customers include New York City Transit and Sanitation, the United States Postal Service, UPS, Fed-Ex, National Grid, Con Ed and PSE&G. Distinguished large bus and truck manufacturers installing Rosco product on new vehicles include New Flyer, Prevost, Nova, Gillig, Navistar / IC Bus, Freightliner/Thomas Bus, and Blue Bird.